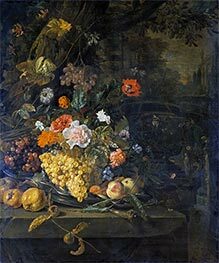 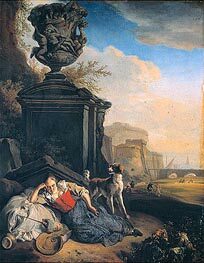 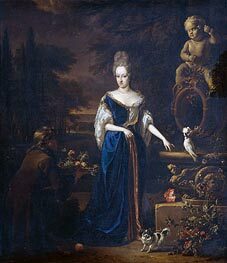 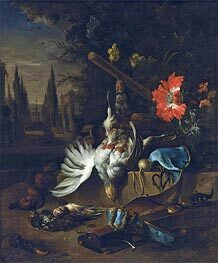 Jan Weenix (1640/42, Amsterdam - buried Sep 19, 1719, Amsterdam ) was a Dutch painter. 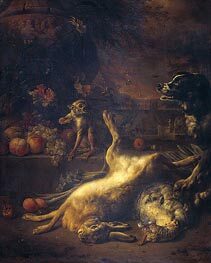 He was trained together with his cousin Melchior d'Hondecoeter by his father, Jan Baptist Weenix. 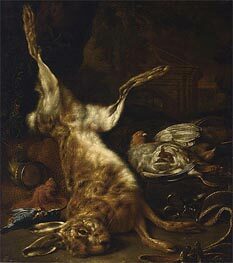 He was a member of the Utrecht guild of painters in 1664 and 1668. 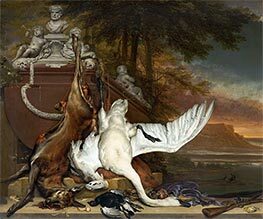 Like his father, he devoted himself to a variety of subjects, but his fame is chiefly due to his paintings of dead game and of hunting scenes. 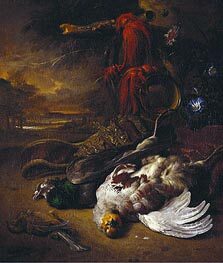 Many pictures in this genre formerly ascribed to the elder Weenix are now generally considered to be the works of the son. 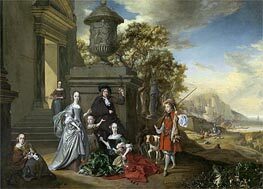 By the age of twenty Jan Weenix rivalled and then subsequently surpassed his father in breadth of treatment and richness of colour. 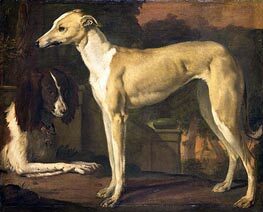 His date of birth is not exactly known. 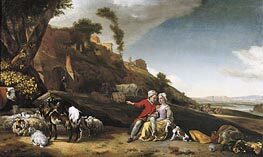 In 1679 when he married Pieternella Backers he told the sheriff he was around thirty! 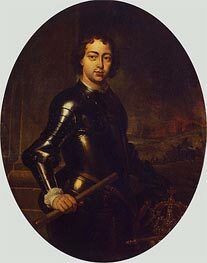 In 1697 he made a portrait of Peter the Great, while visiting Amsterdam. 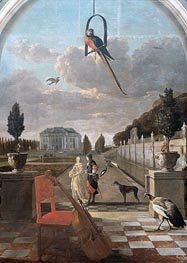 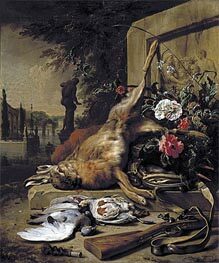 At that time Jan Weenix was employed in Amsterdam to decorate a private house with wall paintings on canvas; they survived in the house until 1921 when the paintings with hunting scenes by Jan Weenix were bought backstairs by William Randolph Hearst. 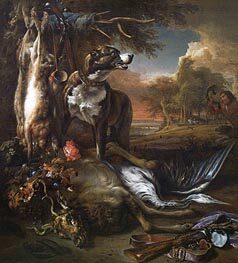 Between 1702 and 1712 Weenix was occupied with an important series of twelf large hunting pictures for the Elector Palatine Johann Wilhelm's castle of Bensberg, near Cologne. 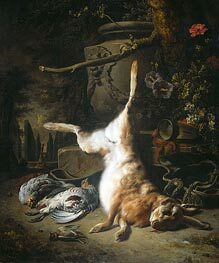 Some of these pictures are now at Munich Gallery. 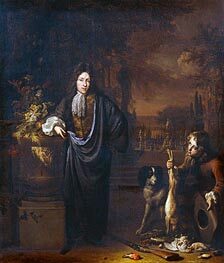 Jan Weenix died in Amsterdam in 1719. 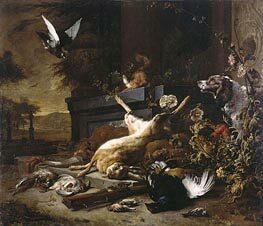 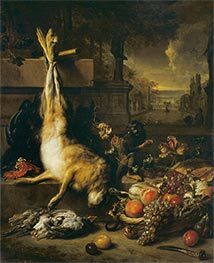 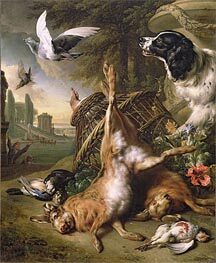 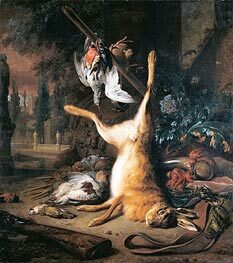 Many of his best works are to be found in English private collections, though the National Gallery, London has only a single example, a painting of dead game and a dog. 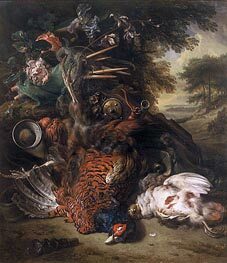 Jan Weenix is well represented in the galleries of Amsterdam, The Hague, Haarlem, Rotterdam, Berlin, and Paris. 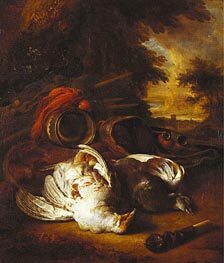 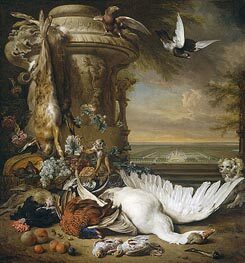 A medium sized Weenix, "Still Life with Dead Game" hangs in the dining room of the Filoli estate in California.